The Lyric Bee: Name That Song! 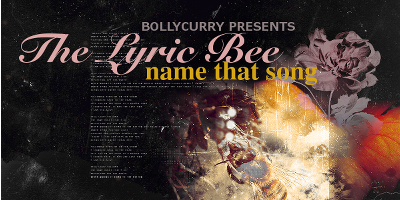 A favorite feature of all the music lovers, BollyCurry presents the latest edition of the ever popular contest The Lyric Bee: Name That Song. We look forward to your enthusiastic participation and all the guesses. For our first time readers, here is a simple introduction to the game. The Lyric Bee: Name That Song is about testing your Bollywood music knowledge and speedy recognition of the various songs. Listed below are a few lines of three different Bollywood songs translated into English. Your task is to translate these lines into their original Hindi verses and tell us which song the lyrics belong to. Sounds interesting, right? Then let's get going! For our readers who are sweltering in the heat of summer, the April edition of Lyric Bee brings you famous Bollywood rain songs that would provide some welcome respite. Please Note: It is important to first translate the lines and then name the song in order for your answers to be correct. It is moving forward to where, I am unaware"
Leave them open, so that the night is free"
I wish to make one such..of loyalty Even if it is left, it shall not separate Even if broken, it shall not break"
Before we bid you adieu, here are the answers to the songs in the previous edition of The Lyric Bee: Name That Song! Congratulations to all those who guessed the songs correctly. So now what are you waiting for? Want to prove it once again that no one can beat your knowledge of Bollywood songs? Then go ahead and leave us your answers in the comments below. The answers to this week's songs will be revealed in our next edition. Until then, keep guessing! Editor(s): Kalpana K.C. and Hershi J. Do you have suggestion or comment for BollyCurry? Drop us a PM at BC_Dropbox today!